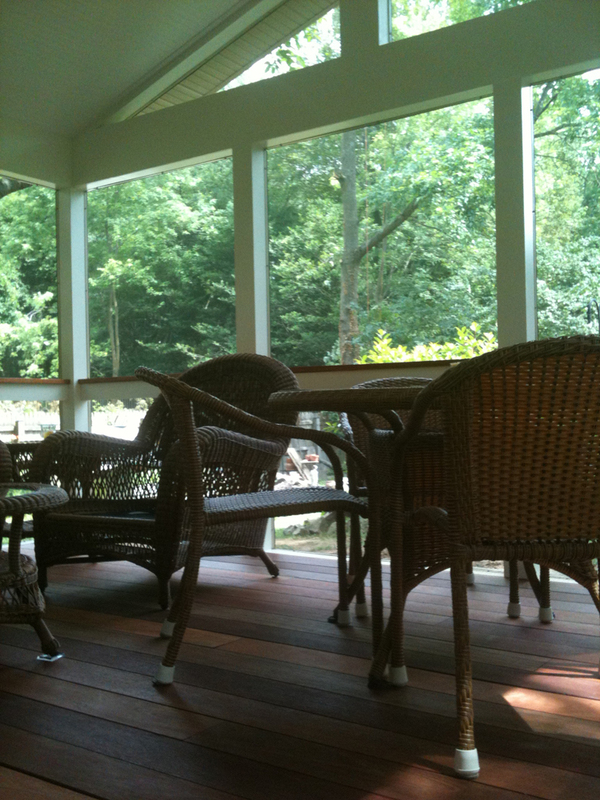 These homeowners in Bethesda, MD got just what the doctor ordered with this beautiful low-to-grade screened porch by Archadeck of Maryland. As any good doctor will tell you “an ounce of prevention is worth a pound of cure”. Since this structure is right on the grade of the property proper preventative measures were taken during construction to make sure the structure was around for many years to come. 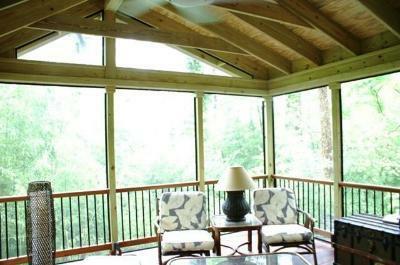 The homeowners decided upon a screened porch with a vinyl trimmed interior and exterior and finished with deep, rich mahogany flooring and a mahogany rail cap. Even though the mahogany flooring is rated for outside use, Archadeck of Maryland took preventative measures to ensure moisture did not make this beautiful flooring cup or fall victim to water problems in the future. First we poured a concrete slab and applied moisture barrier under and above the slab. We used EPDM moisture barrier which is typically used for flat porticoes and provides excellent performance. We then installed sleepers. This is wood that sits atop a concrete slab to provide a surface to nail the flooring into. 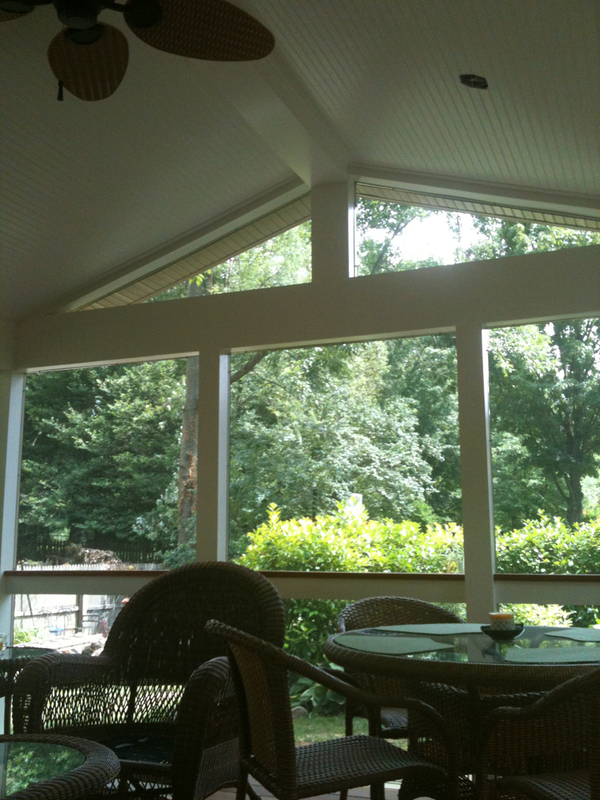 Since the homeowners wanted maximum ventilation within the screened porch, we built the structure without a knee wall. Since vinyl paints really well as opposed to wood which can flake off due to the expansion and contraction that is natural in most woods, the homeowners decided to paint the vinyl to match the existing home. 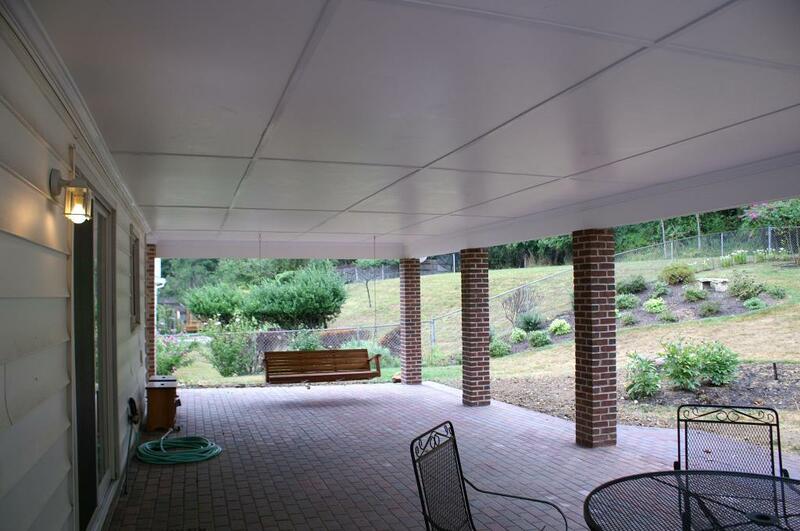 The homeowners decided upon a ply bead ceiling which they also chose to paint. 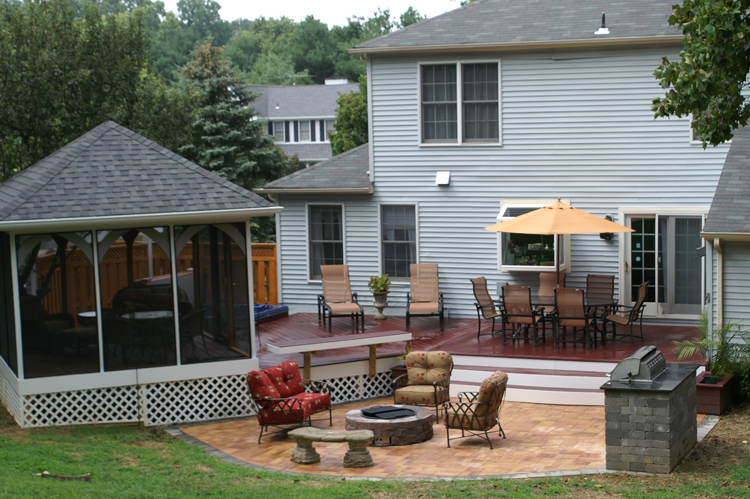 Archadeck of Maryland painted not only the screened porch area, we also were able to paint the siding on the exterior of their home and the shutters for them as well. 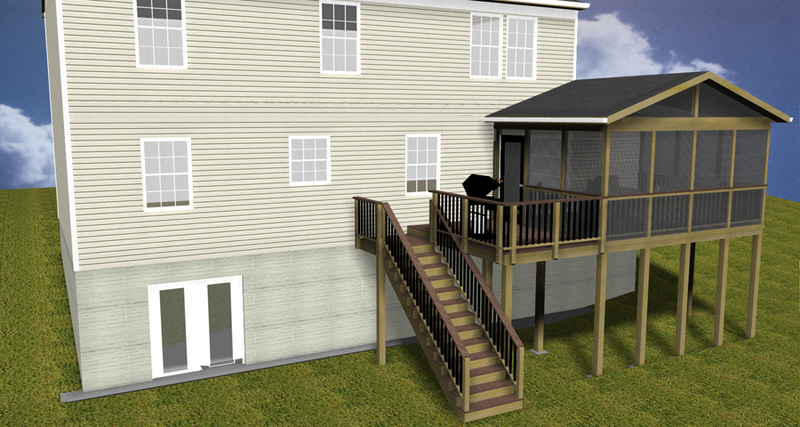 In many cases homeowners need and want assistance with other tasks that are not directly related to our task which is building the outdoor structure. Since we have the skills, experience and desire to help our clients with other needs, we are always happy to accommodate that need for them. In this case we were even able to pressure wash their home and patio and extend their french drain. 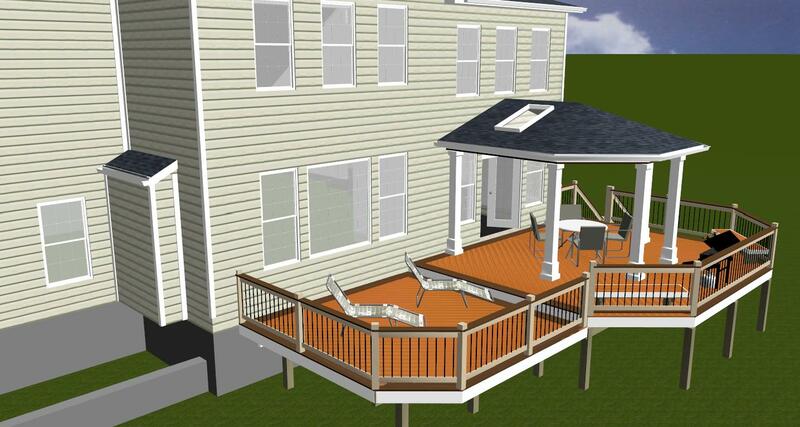 Archadeck of Maryland will be re-doing the patio for these homeowners in the future. During construction of the screened porch the homeowners new outdoor furniture arrived and it turned out to be a little larger than anticipated. The homeowners pondered whether to extend the size of the structure to accommodate the furniture. After careful consideration Archadeck of Maryland made some slight adjustments for the furniture to fit. 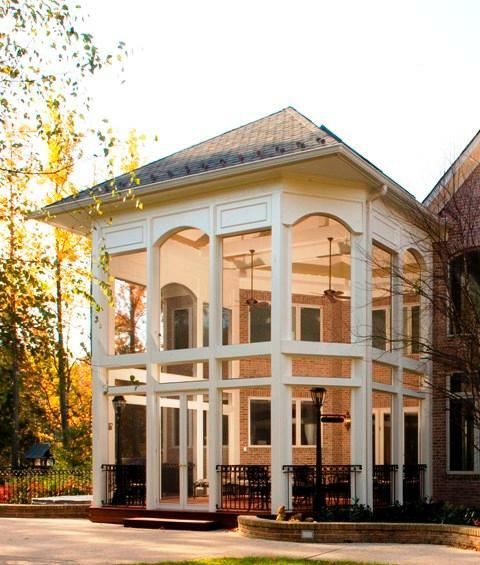 With a structure such as a screened porch scaling a project is important to the structural integrity of the new structure and how it harmonizes with your home. Bigger does not always mean better. 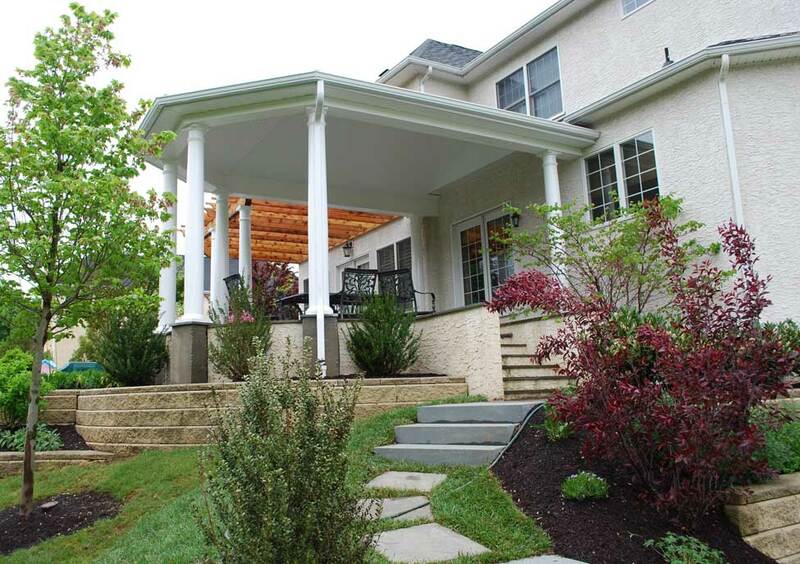 As with the case of this structure, once the structure was completed these Bethesda, MD homeowners were elated with the finished product. Now they have a splendid spot to spend long afternoons watching nature unfold around them. 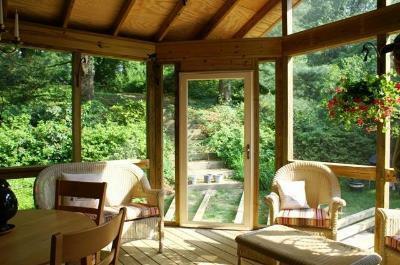 You can also visit our photo gallery to see other beautiful screened porch ideas for more viewing enjoyment. 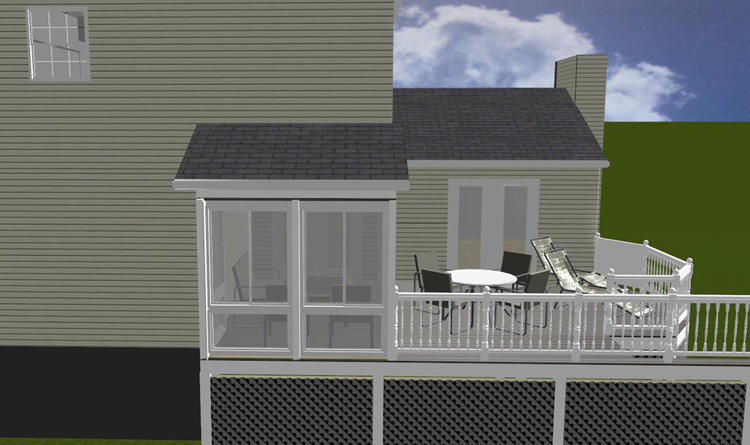 What is even better than the luxury and enticing beauty of having a screened porch? 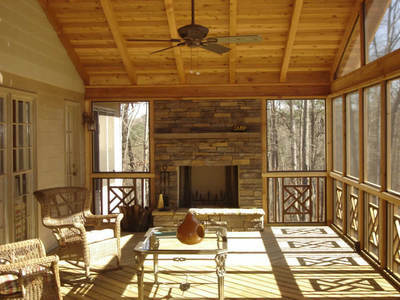 The answer is the addition of an outdoor fireplace within your screened porch. Adding an outdoor fireplace can turn up the heat on style to your screened porch as well as a gathering spot for conversation and memorable moments. 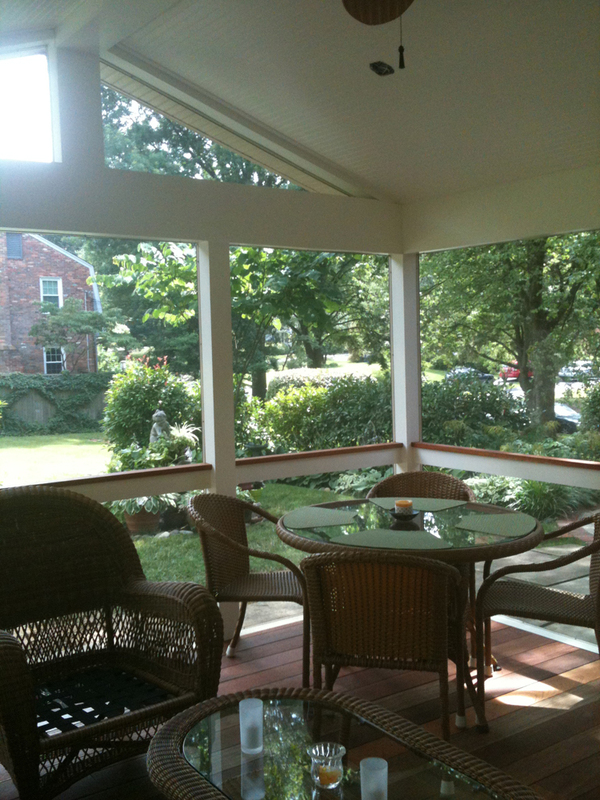 These homeowners in Potomac, MD had an existing patio they wanted to convert into a screened porch. 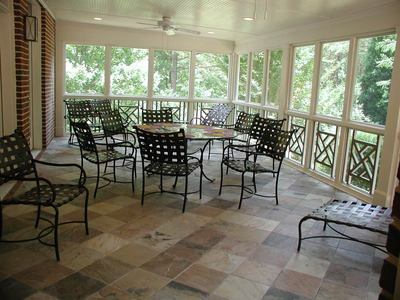 The existing patio floor was done in blue flagstone and the homeowners were quite fond of it and wished to keep it and use this as the floor for the screened porch. This type of floor presented a challenge to work with because of the undulation of the flagstone caused the floor to not be perfectly flat. Archadeck of Maryland had to adjust the bottoms of the walls to make sure they were plumb regardless of what was going on with the wall itself. 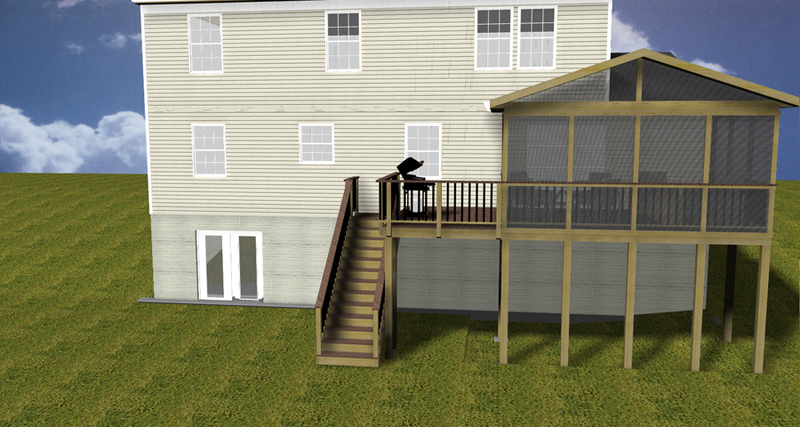 There are about four steps down from the living area level into the patio area. 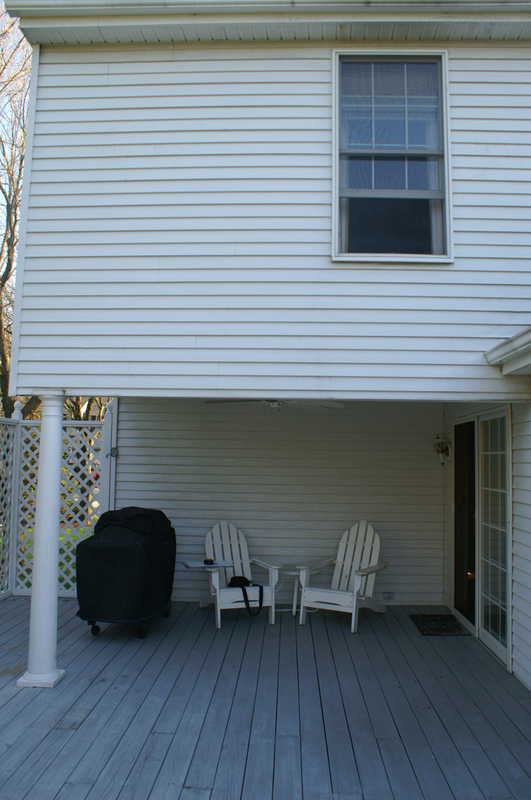 The pitch and height of the roof was dictated by the family room , which is adjacent to the patio. 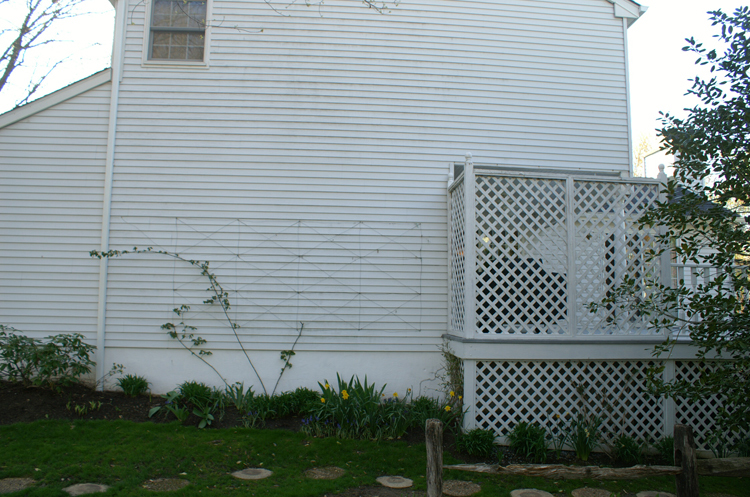 They also had a window at the second level that the gable would obscure. 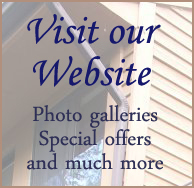 We removed this window, which was something the homeowners had been planning to do anyway. We installed four beautiful Velux skylights for added light and to add character to the structure. 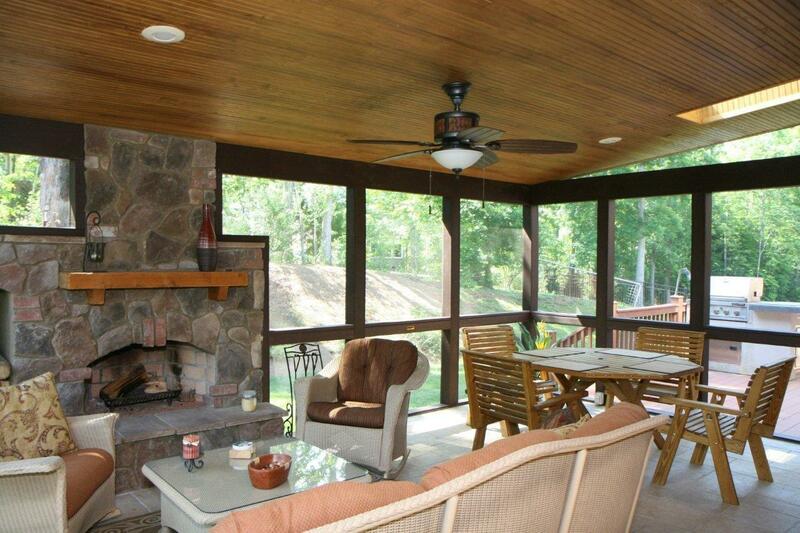 We also added a very nice ceiling fan to the screened porch and recessed lighting. 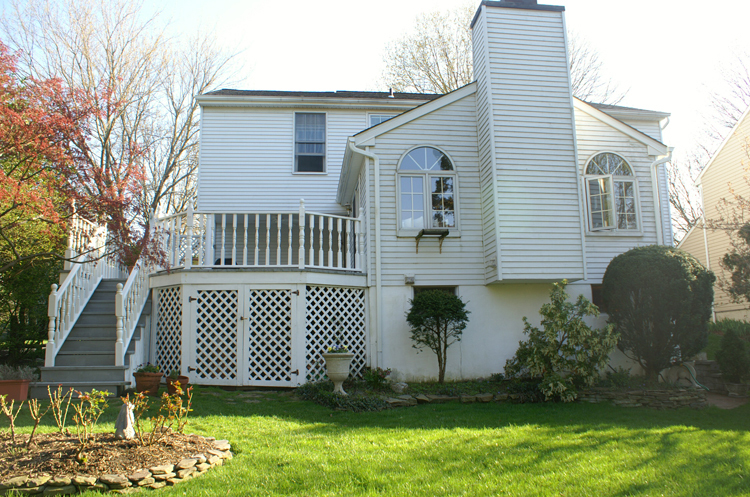 The homeowners wanted to use decorative columns which varied in size. The column size created some challenges for the screening system because you want the screens all in one plane, so having variations in column sizes can cause trouble. 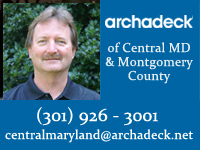 Archadeck of Maryland trimmed the entire structure in durable vinyl inside and out. Our customers actually did not decide about the addition of the outdoor fireplace until after we had started the job. 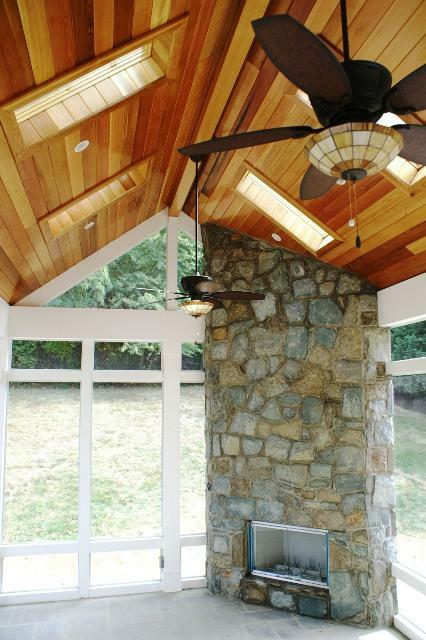 They chose a gas fireplace and decided to run the stunning stone facade all the way to the ceiling. The homeowners chose the same stone that was already on the fireplace in their home’s living room, keeping the integrity and harmony running from their interior throughout their exterior. 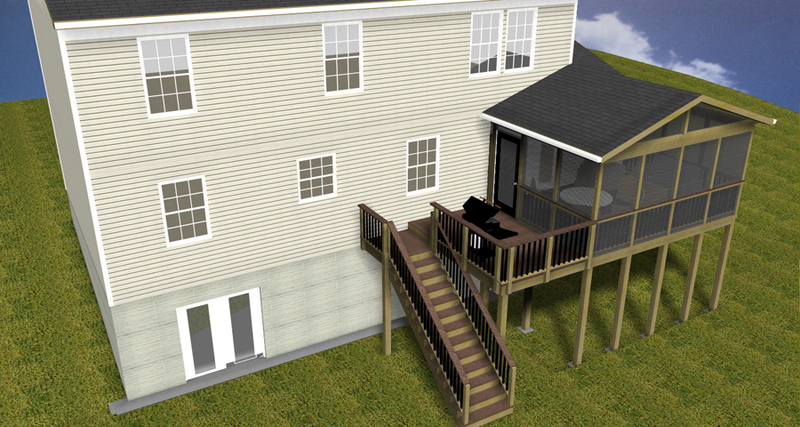 We had begun this job thinking we were converting a patio into a screened porch. 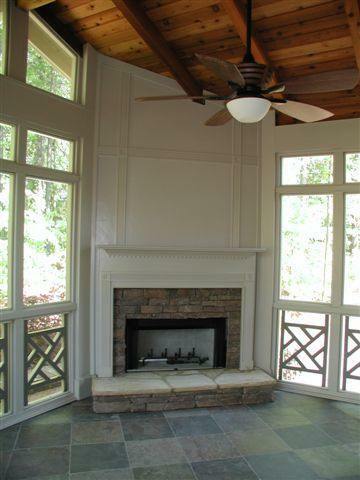 When these homeowners decided to add an outdoor fireplace to the screened porch it was like a match made in Heaven, a total transformation. A conversion of this type totally changes the personality of a structure like this for the better. Posted in Archadeck of Maryland, Custom deck and porch materials, Maryland porch builder, Outdoor fireplace, Screen porch, Screened porch with outdoor fireplace, Screened porches, Velux skylights	Tagged Archadeck Maryland, Archadeck of Central Maryland, Archadeck of Montgomery County, Central MD deck and porch builder, Maryland screen porch, Maryland screened porch with outdoor fireplace, MD, MD screened porch with outdoor fireplace, Potomac, screened porch builder Maryland, Screened porch Potomac MD, Screened porch with outdoor fireplace in Potomac, Velux skylights, Velux skylights Montgomery cty. 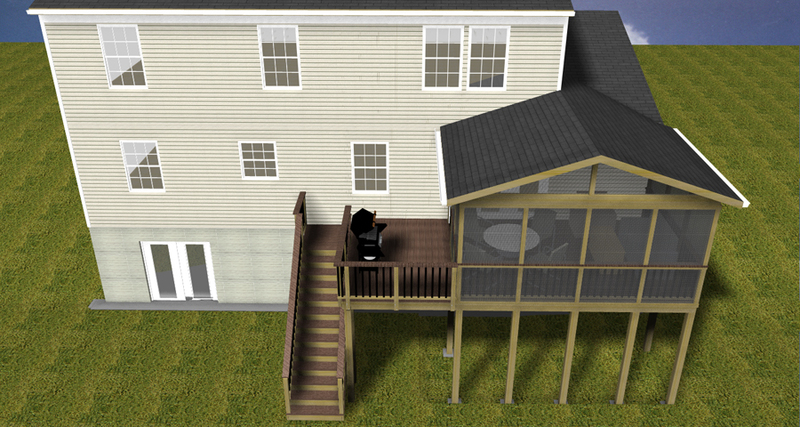 Here at Archadeck of Maryland we build many different porches and patios. The picture shown to the right is one such structure. 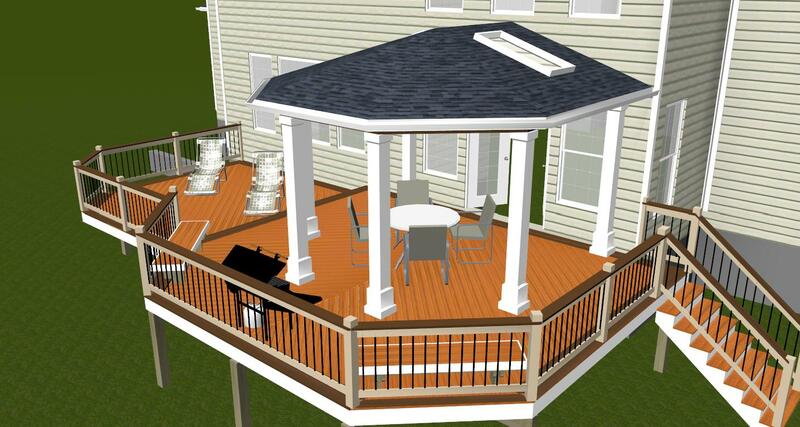 This open porch design has a unique octagon roof which the homeowners we built it for fell in love with, as well as myself. 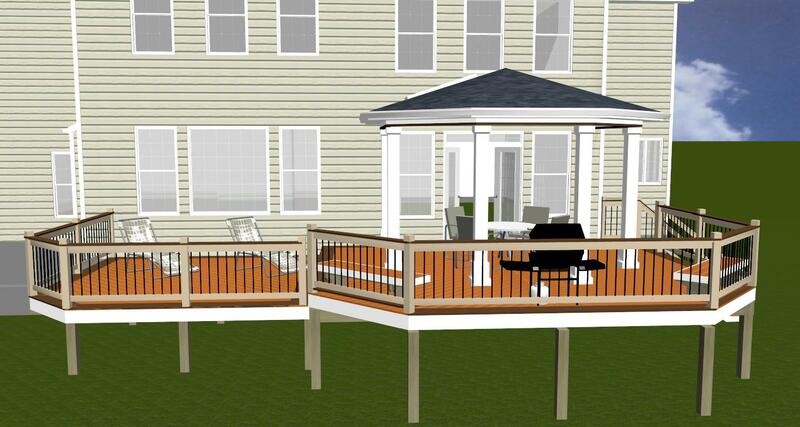 This open porch flows harmoniously between the covered area to the deck and beyond. 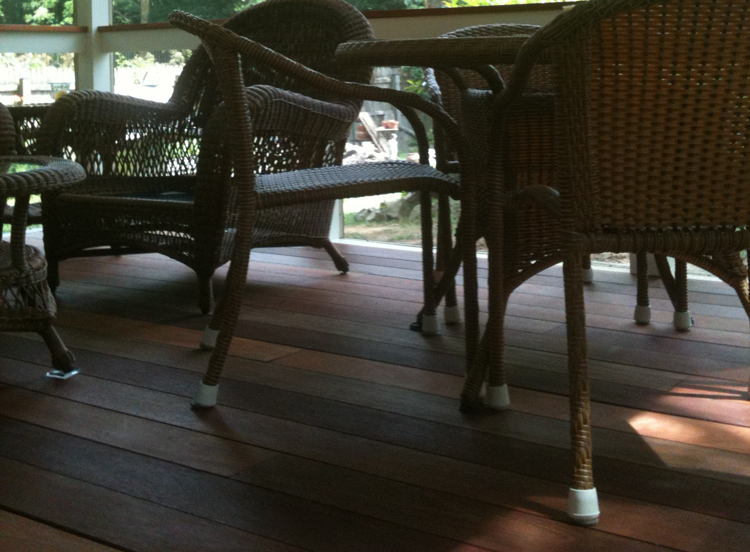 We extended the floored area on the deck an additional four feet to give the necessary space for the furniture and for movement around the furniture. 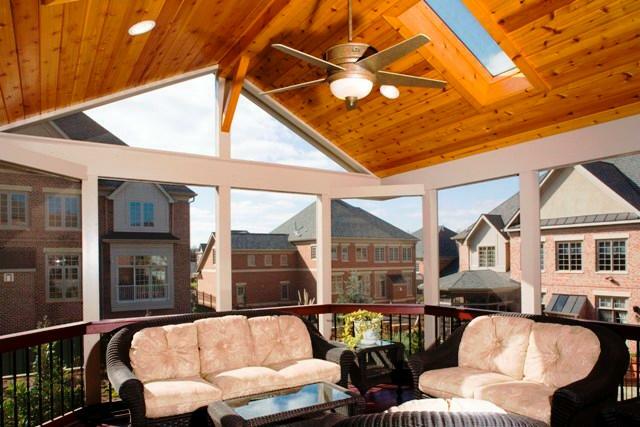 Many outdoor structures offer convertibility to a sunroom or more of an indoor-type room addition. 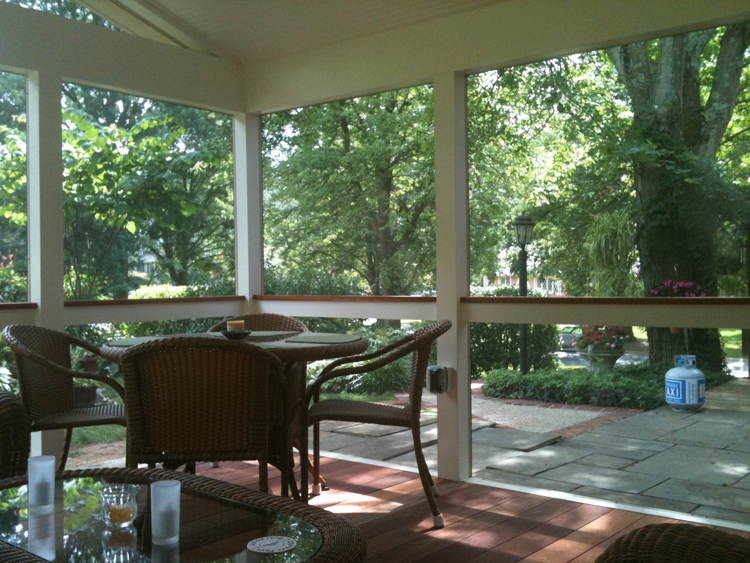 I find that the primary motive for going for a screened porch vs. an open porch is for bug protection. Many people want to be outdoors but not bothered by the bugs. 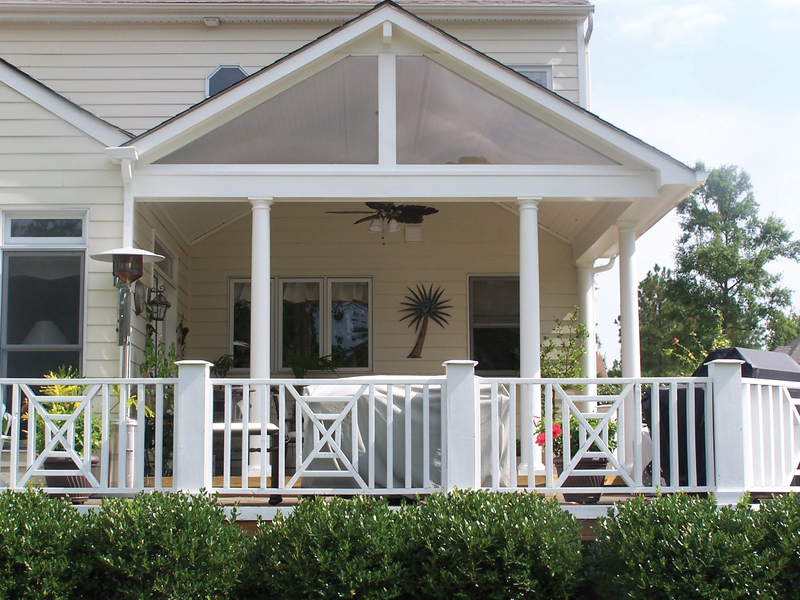 Screened porches also offer a little more protection from the sun as well. 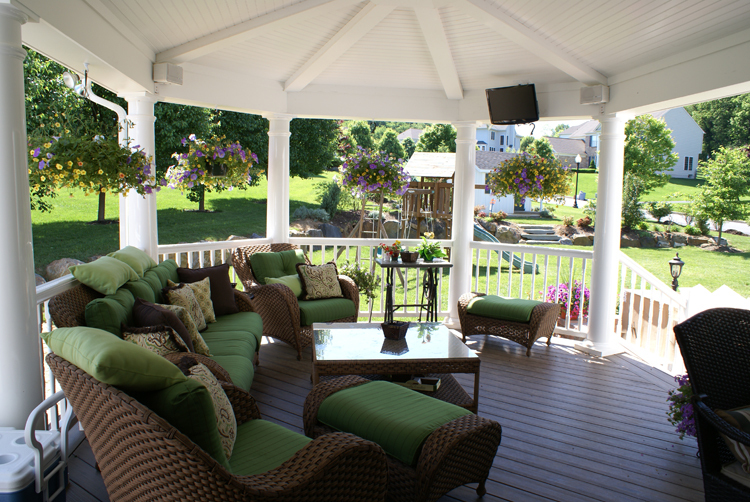 If people had the ability to have a covered porch without the bugs however, most often they would prefer it over the screened porch because it offers a more open flow and feel to the space. 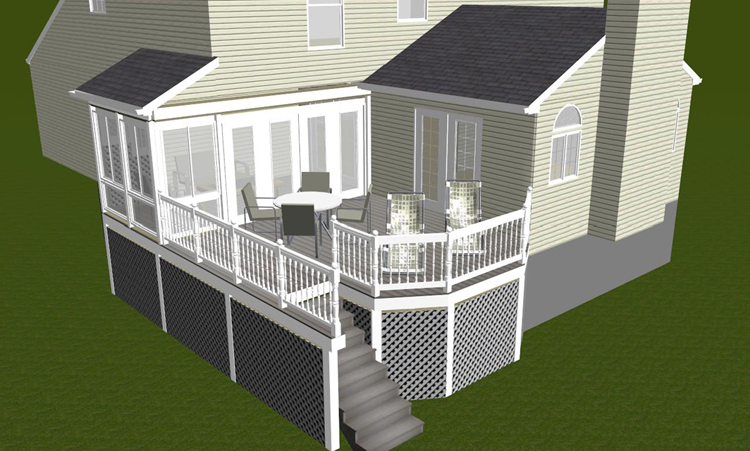 One of the disadvantages of an open porch is if the future you want to convert it to an addition, for example, with decorative columns, that conversion would not be as straight forward. 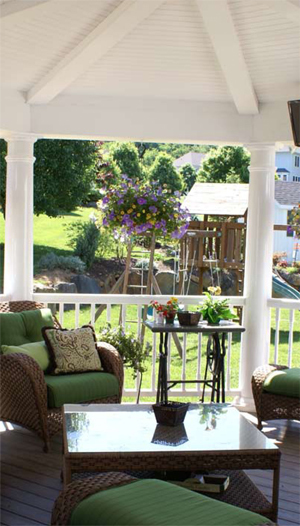 Screened porches offer some convertibility if you wish to make it a convertible porch and then you can get some use out of it in the colder months. Convertible windows are a viable convertibility option and we have seen some interesting uses from them in coastal environments. You can also use a sliding panel system, such as the artistic enclosures screen plus system. 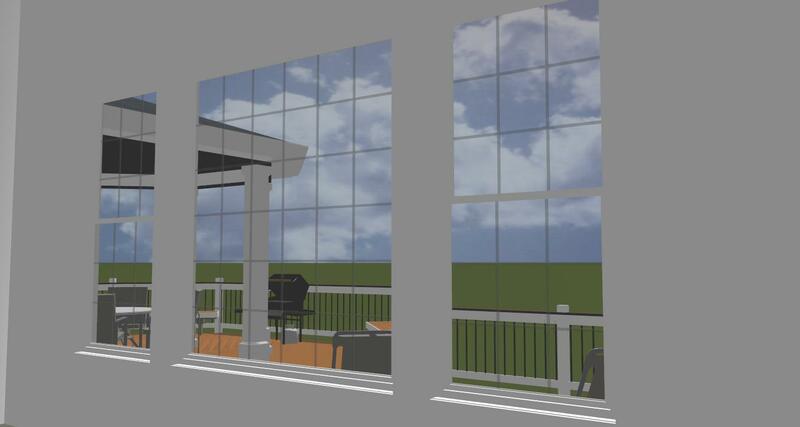 With this system the windows can be lifted completely out to convert a sunroom easily into a screened porch. 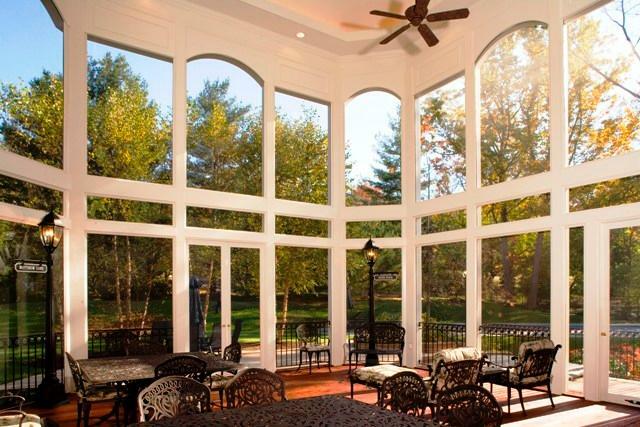 Horizontal sliding windows, also by artistic enclosures, mimic the function of a sliding door. 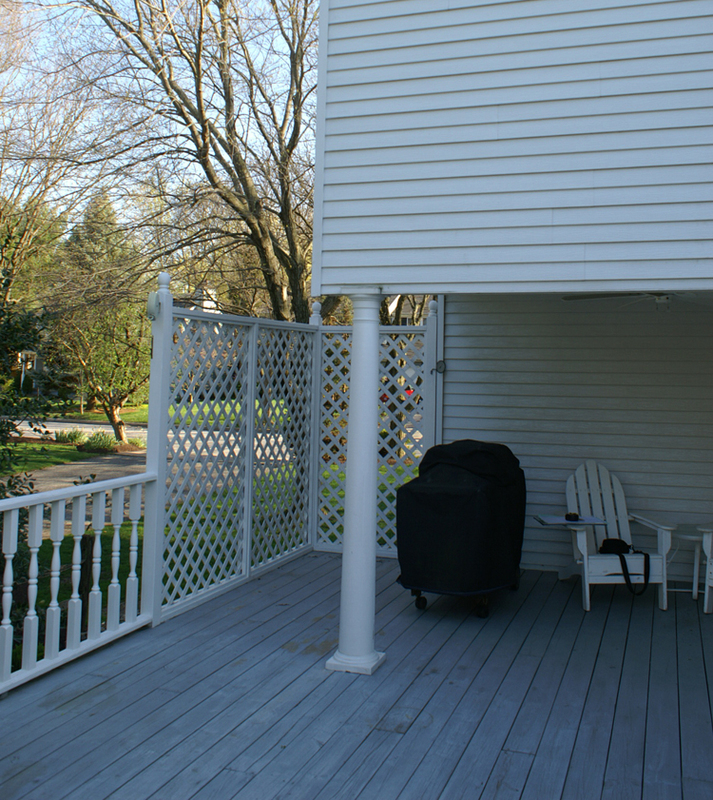 Both open porches and screened porches are quite popular here at Archadeck of Maryland. 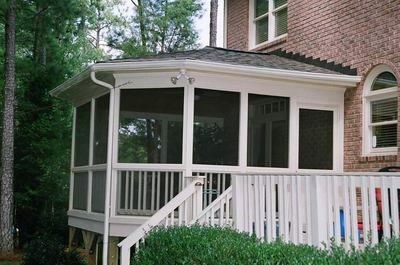 Screened porches are more easily convertible, but the beauty and open feel of the covered porch is still a favorite among our clients.